ALCOTEXA is a non-profit making and non-trading organization exclusively concerned with exporting Egyptian lint cotton. 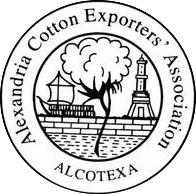 The Alexandria Cotton Exporters' Association is formed of individuals and companies working in the cotton exporting sector. Non members of the Association are not allowed to practice lint cotton export. The aim of our association is to develop cotton trade among exporters, importers, spinners and other stakeholders inside or outside the country. In conjunction with registering the contracts, we minutely follow up the contract execution, offering in accordance the service of Arbitration & Mediation. The Cotton Egypt Association (CEA) is the only entity, authorized by us, to manage the trademark Egyptian Cotton Logo™, which has been introduced to the international cotton industry as a mark of quality, in order to raise costumer's awareness of distinguishing between products made out of 100% Egyptian cotton and other products. CEA is responsible to manage the license accrediting process for firms, either local or non-local, in order to permit the use of the trademark for products (100% made by Egyptian cotton) labeling.